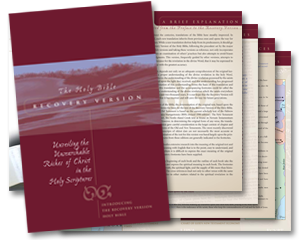 The Recovery Version contains over 15,000 extensive footnotes stressing the revelation of the truth, the spiritual light, and the supply of life. And God said, 1Let Us make man in Our image, according to Our likeness; and let them have dominion over the fish of the sea and over the birds of heaven and over the cattle and over all the earth and over every creeping thing that creeps upon the earth. 261 Let Us...reveals that a council was held among the Three of the Godhead regarding the creation of man. The decision to create man had been made by the Triune God in eternity past, indicating that the creation of man was for the eternal purpose of the Triune God (Eph. 3:9-11). God's intention in creating man was to carry out His divine economy for the dispensing of Himself into man (1 Tim. 1:4 and note 3, par. 1). This is fully unveiled in the following books of the Bible. And you shall be to Me a 1kingdom of priests and a holy nation. These are the words that you shall speak to the children of Israel. 61 As God's people remain in His presence, they become a kingdom of priests and a holy nation (Rev. 1:6; 5:10; 1 Pet. 2:9). As priests, God's people live in God's presence, enjoying Him as their portion, even as He enjoys them as His treasure (v. 5). The mutual enjoyment between God and His people separates His people unto Himself from everything other than Him, making them a holy nation. The burden of the word of Jehovah concerning Israel. Thus declares Jehovah, who stretches forth the heavens and lays the foundations of the earth and forms the 1spirit of man within him. 11 In His creation God made three crucial, equally important items—the heavens, the earth, and the spirit of man. The heavens are for the earth, the earth is for man, and man was created by God with a spirit that he may contact God, receive God, worship God, live God, fulfill God's purpose for God, and be one with God. In His economy God planned to have Christ as the centrality and universaltiy of His move on earth. For His chosen people, who would care for Him as the Creator and as the Redeemer, there was the need for Him to create a receiving organ so that they would have the capacity to receive all that God had planned for Christ to be. Hence, this book charges us to pay full attention to our human spirit, that we may receive the Christ revealed in this book and may understand all that is revealed therein concerning Him (Eph. 1:17-18a; 3:5). Your words were found and I 1ate them, and your word became to me the gladness and joy of my heart, for I am called by Your name, O Jehovah, God of hosts. 161 According to the entire revelation in the Holy Bible, God's words are good for us to eat, and we need to eat them (Psa. 119:103; Matt. 4:4; Heb. 5:12-14; 1 Pet. 2:2-3). God's word is the divine supply as food to nourish us. Through the word as our food, God dispenses His riches into our inner being to nourish us that we may be constituted with His element. This is a crucial aspect of God's economy. When we eat God's words, His word becomes our heart's gladness and joy. But as it is written, "Things which eye has not seen and ear has not heard and which have not come up in man's heart; things which God has prepared for those who 3love Him." 93 To realize and participate in the deep and hidden things God has ordained and prepared for us requires us not only to believe in Him but also to love Him. To fear God, to worship God, and to believe in God (that is, to receive God) are all inadequate; to love Him is the indispensable requirement. To love God means to set our entire being—spirit, soul, and body, with the heart, soul, mind, and strength (Mark 12:30)—absolutely on Him, that is, to let our entire being be occupied by Him and lost in Him, so that He becomes everything to us and we are one with Him practically in our daily life. In this way we have the closest and most intimate fellowship with God, and we are able to enter into His heart and apprehend all its secrets (Psa. 73:25; 25:14). Thus, we not only realize but also experience, enjoy, and fully participate in these deep and hidden things of God. And the 1peace of God, which surpasses every man's understanding, will guard your hearts and your thoughts in Christ Jesus. 71 The result of practicing fellowship with God in prayer is that we enjoy the peace of God. The peace of God is actually God as peace (v. 9) infused into us through our fellowship with Him by prayer, as the counterpoise to troubles and the antidote to anxiety (John 16:33). 32 The Lord's intention in this chapter was to bring man into God for the building of His dwelling place. But between man and God there were many obstacles, such as sin, sins, death, the world, the flesh, the self, the old man, and Satan. For the Lord to bring man into God, He had to solve all these problems. Therefore, He had to go to the cross to accomplish redemption that He might open the way and make a standing for man, that man might enter into God. This standing in God, being enlarged, becomes the standing in the Body of Christ. Anyone who does not have a standing, a place, in God does not have a place in the Body of Christ, which is God's dwelling place. Hence, the Lord's going in order to accomplish redemption was to prepare a place in His Body for the disciples. That which is born of the flesh is flesh, and that which is born of the Spirit is 2spirit. 62 The first Spirit mentioned here is the divine Spirit, the Holy Spirit of God, and the second spirit is the human spirit, the regenerated spirit of man. Regeneration is accomplished in the human spirit by the Holy Spirit of God with God's life, the uncreated eternal life. Thus, to be regenerated is to have the divine, eternal life (in addition to the human, natural life) as the new source and new element of a new person. And He told them this 1parable, saying, Which man of you, who has a hundred sheep and has lost one of them, does not leave the ninety-nine in the wilderness and go after the one which is lost until he finds it? 31 In answering the self-righteous Pharisees and scribes, who condemned Him for eating with sinners, the Savior spoke three parables, unveiling and depicting how the Divine Trinity works to bring sinners back, through the Son by the Spirit, to the Father. The Son came in His humanity as the Shepherd to find the sinner as a lost sheep and bring him back home (vv. 4-7). The Spirit seeks the sinner as a woman carefully seeks a lost coin until she finds it (vv. 8-10). And the Father receives the repenting and returned sinner as the "certain man" here receives his prodigal son (vv. 11-32). The entire Divine Trinity treasures the sinner and participates in bringing him back to God.